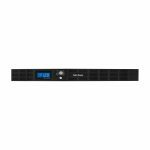 Designed with line interactive topology and simulated sine wave output, CyberPower Smart App LCD rackmount and rack/tower UPS models offer guaranteed power protection for departmental servers, networking hardware, and other equipment capable of using simulated sine wave output. 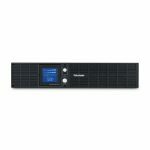 These models provide cost-effective, feature-rich power protection for networking, servers, and telecom equipment. They correct minor power fluctuations without switching to battery, thereby extending battery life — essential in areas where power fluctuations occur frequently. Features include a multifunction LCD panel, Automatic Voltage Regulation (AVR), energy-saving GreenPower UPS™ design, data line protection, and management software to easily control and monitor your UPS.